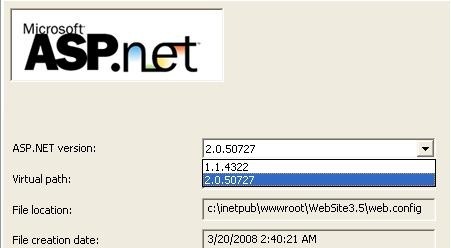 If we install .NET 3.5 and try to check Asp.NET version dropdown we will get only 2.0.5072 or 1.1.4322 versions there is no 3.5 version. Now we will get many questions like why this happened? What exactly .NET 3.5 version is? Whether we need to set any separate configurations to deploy .NET 3.5 applications? and many more questions. If we observe asp.net 3.5 features it is just extension of asp.net 2.0 version it’s not a standalone framework like 2.0 version or 1.0 version because of that we won’t get 3.5 version in ASP.NET version dropdownlist. If we want to publish or deploy website with 3.5 version we don’t want to make any modifications in configurations. Here if we observe above code it creating new compilers by using these we can say that version 3.5 has to be used in application.